Did you ever walk into a garden and somehow you just knew where to wander? The placement of the planting beds, the lure of any focal points, even the way the birds flew, drew you into the garden. As you wandered through, you felt like the garden was gradually revealing itself to you, guiding you on where to walk. In either case, I would like a garden that is easy to wander through, that in some places presents a very distinct path to purposely walk down, but in other areas presents a blurred path, one that is more subtle but that still leads you through the garden or out onto a bit of lawn. To be wanderable (another word that somehow the dictionary writers missed), I think the garden shouldn’t have a bunch of right angles to walk around, unless it is a raised bed vegetable garden, which is usually accepted as being full of paths with right angles. But elsewhere in the garden there should be no intersection that looks like it presents four choices on which direction to walk. That would always remind me of the yellow brick road in the Wizard of Oz and the Scarecrow without a brain. I would always imagine the Scarecrow hanging on a post at the intersection pointing in first one direction and then another direction, indecisively trying to direct people on where to go in the garden. The garden should decide! I think you should be able to enjoy a lovely evening garden stroll just before the sun disappears, in the last light of day, the glooming, with the garden paths leading you along so that you can be lost in thought. You shouldn’t encounter a place where you have to decide “go left, go right, go straight, or turnaround”. Why? Because every day we have to make a thousand decisions. Big decisions, little decisions, fast decisions or well thought out decisions. When we are walking in the garden, let the garden decide for us. That’s what the garden design element of wanderability means to me. *I should note that these five garden design elements that I'm posting about are what I am looking for in a garden. I do not have training or experience in garden design, landscape design or any design. In college, I avoided the design classes in favor of classes in floriculture, woody ornamentals, insect pests of ornamental plants, herbaceous ornamentals, plant taxonomy... subjects like that. Oh, wait, I did take a class in floral design just for fun, and it was fun. 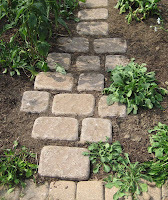 Our garden paths have choices, but it more like a skein of threads, different routes to walk Around the garden. A place to meander and look is a wonderful, wanderable thing. It is good that you have taken time before you do major changes in your garden. You know how you use it. You know how you want to use it so it is perfect timeing to get someone in there to help you define that wanderability that you know is there even if you can't quite put your finger on it. Carol, "Wanderability" is what I want for my garden, too. My first plans for my garden were based on straight lines and right angles and then at the State Fair a couple of years ago, the local garden club had display gardens on the theme of a tribute to Elizabeth Lawrence. All but one of them had right angles (as did Elizabeth's garden, I believe) but the one that made a curving path (wanderability) was was SO much more appealing even though in most respects (and plants) all the gardens were very similar. THAT was the moment I changed my design for my garden! You are so right - great post. We are faced with way too many choices every day. The garden is the place to unwind and reconnect with the earth. Wanderability should totally be a word. I know most gardeners complain about too much space, but there is a downside to all the space in the world. Setting boundries is a challenge. My garden doesn't do much directing but I am building up the lure to The Rose Walk. Wanderability ... great word, Carol! Add it to the lexicon! It's very important to me in my garden, too. My paths require choices because I'm way too utilitarian. I've put in paths where I know people will walk, or where I want to walk. I also don't like deadends, so I try to have paths loop back to each other. But you are right, that the path should reveal the garden slowly, like telling a story. Mine don't & I wish I could figure out a way for them to do so, while balancing the demands made by the tromping feet of meter readers and running kids. Love your words and garden design concepts. Wanderability, yes. One of my pet peeves is paths that curve for no reason especially in the middle of an open space like a lawn. It's not logical. If a path curves, add a tree, or a shrub, or a bed for it to curve around. Just my opinion.